Tokamak Energy is delighted to announce the appointment of Professor Laurence Williams OBE FREng FIMechE FNucI as Chair of its new Regulatory and Safety Committee. Professor Williams is an Emeritus Professor in Nuclear Safety and Regulation and is currently a Senior Research Investigator at Imperial College. He was formerly Her Majesty’s Chief Inspector of Nuclear Installations. He has also been Chair of the International Nuclear Regulators Association, Chair of the IAEA Commission on Safety Standards, and more recently Chair of the UK Government’s Committee on Radioactive Waste Management. Fusion energy has the potential to provide mankind with a safe, abundant and clean source of energy. Fusion produces no greenhouse gases and no long-lived radioactive waste, yet it produces vast amounts of energy from very little fuel. 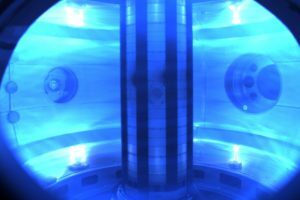 Tokamak Energy’s technology will achieve faster deployment of commercial fusion power for electricity and heat production, so early thinking about regulation is required. “Safety and security are crucial aspects of any emerging technology especially for one as exciting and widely deployable as fusion energy. I will be helping Tokamak Energy to develop robust processes for developing and delivering safe and secure fusion energy solutions. “Fusion offers the prospect of safe, dispatchable carbon free energy. As we progress towards commercial fusion, we aim to work with regulators and industrial partners to develop an appropriate regulatory framework for fusion. Professor Williams knowledge and expertise will inform our strategy and help guide us through this process”. Tokamak Energy is a private company working to develop compact fusion power. The firm is led by experienced management and employs a team of magnet engineers and fusion experts from globally renowned public and private institutions. Tokamak Energy grew out from Culham Laboratory, which is the world’s leading center for magnetic fusion energy research and home to the world’s most powerful tokamak, JET, which produced 16MW of fusion power in 1997. 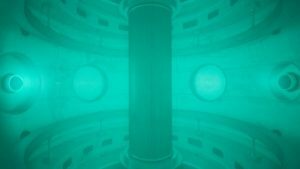 Tokamak Energy is focused on spherical tokamaks, pioneered at Culham, because these compact devices can achieve a much higher plasma pressure for a given magnetic field than conventional tokamaks, i.e. they are more efficient. Enhancing this design, Tokamak Energy is deploying high temperature superconducting magnets to control the plasma within its devices. These allow high magnetic fields to be created in the confined dimensions of compact tokamaks, further improving the efficiency of the device. Stage 1: Build a small prototype tokamak to demonstrate the concept (the ST25) – achieved 2013. Stage 2: Build a tokamak with exclusively high temperature superconducting (HTS) magnets (the ST25 HTS) – achieved 2015 with a 29 hour plasma duration. Stage 3: Reach fusion temperatures of 100 million degrees in a compact tokamak (the ST40), followed by further development of the ST40 to produce high density plasmas and to approach fusion energy gain conditions. Stage 4: Achieve industrial scale energy with the ‘Fusion Power Demonstrator’ by 2025. Stage 5: Produce commercially viable fusion power with the first ‘Fusion Power Module’ by 2030. In 2017, Tokamak Energy was selected by the International Energy Agency (IEA) as one of three leading innovative ideas in fusion. 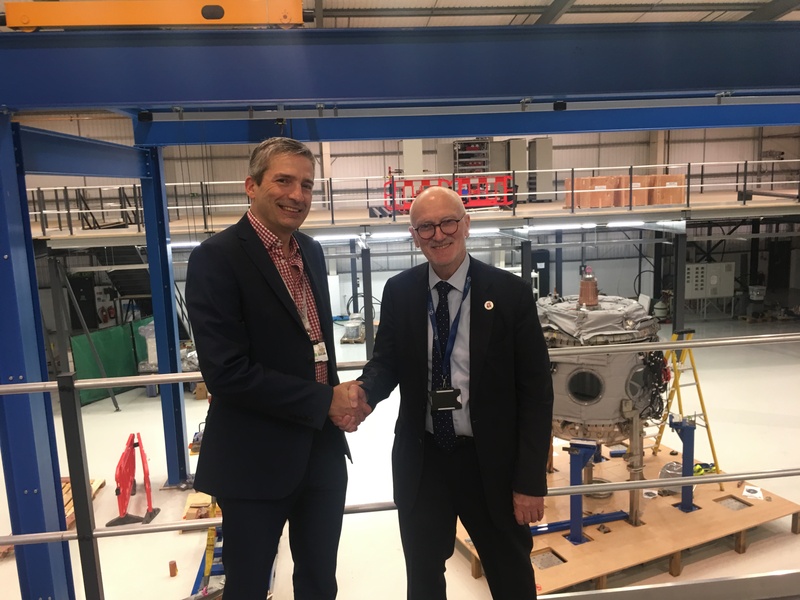 It was the only UK representative invited to speak at the IEA’s meeting on developing fusion power, and Tokamak Energy’s Co-Founder Dr David Kingham presented the company’s plans. Tokamak Energy has an eminent Scientific Advisory Board chaired by Lord Julian Hunt FRS. Members include Professor Jack Connor FRS (one of the most influential theoretical plasma physicists in fusion), Professor George Smith FRS (emeritus professor of materials at the University of Oxford), Professor Bill Lee FREng (ex Director of the Centre for Nuclear Engineering at Imperial College London) and Professor Colin Windsor FRS (a neutronics and neural networks specialist). 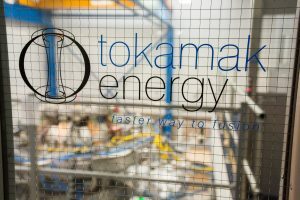 Tokamak Energy has science and engineering offices and a new tokamak engineering facility and superconducting magnet development laboratory at Milton Park near Oxford. 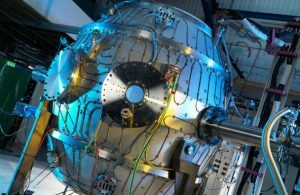 The ST25 HTS tokamak is currently featured in an exhibition on the sun at the Science Museum in London, reminding us all that the sun is powered by fusion energy – and that the same source of energy can be harnessed on earth. Fusion is the reaction that powers the sun and the stars. Energy is released when two small particles come together and fuse into one larger particle. In experiments on Earth, these small particles are the nuclei of deuterium and tritium – types of heavy hydrogen – and they fuse together to make a helium nucleus. The waste product of fusion is helium, which is safe. Fusion produces no greenhouse gases and no long-lived radioactive waste yet it produces vast amounts of energy from very little fuel. The lithium from a laptop battery combined with the deuterium in half a bath of water could supply as much energy at 70 tonnes of coal. As such it offers a clean, green and plentiful energy solution for thousands of years into the future if it can be harnessed on Earth. For fusion reactions to happen the deuterium and tritium must be very hot, so that the particles are moving so fast that if they collide they will overcome the mutual repulsion they feel for each other and get close enough to fuse. At JET, the world’s largest operating tokamak, which once produced 16MW of fusion power, the fuel is heated to more than 100 million degrees – 7 times hotter than the center of the Sun! Tokamak Energy, based just 5 miles away from JET, now aims to achieve this temperature in much smaller, lower cost tokamaks. Magnetic fields are used to keep the superheated fuel (now an electrically charged gas called plasma) from touching the walls of its container and so keep it hot enough for fusion to occur. If the plasma does hit the wall it is not dangerous, it just cools down and everything stops. The specialized machines used by Tokamak Energy and others for fusion are called ‘tokamaks’. ‘Tokamak’ is a Russian acronym that stands for toroidal chamber magnetic coils, which concisely describes the machine – a toroidal (doughnut-shaped) vessel with magnetic coils to trap and control the plasma. When they were introduced in the 1960s, tokamaks showed dramatically improved performance over the other methods being investigated. They heated and trapped the fuel much better than other approaches. Tokamaks were rapidly adopted by many international research teams and have remained the front runners in fusion research ever since.